I don’t know about you, but after a spectacular string of sunny days, it’s hard readjusting to the norm of Portland’s rainy drizzle. While we all wait with crossed fingers in anticipation of summer, make sure you don’t miss your next opportunity to hear from talented writer and poet, Laura Read, who’s coming to campus to give a reading on Tuesday, March 26th at 7:30 pm in the bookstore. I had the honor of corresponding with her, and her lovely responses to my questions are below. Not only does Read, residing in Washington, like yours truly, but she has an extensive list of accomplishments. In addition to being published in places like The New York Times Magazine, her second full-length collection Instructions for My Mother’s Funeral was chosen as the winner of AWP’s Donald Hall Prize for Poetry by Dorianne Laux. 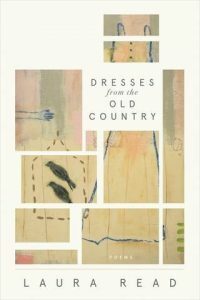 Her most recent collection, Dresses from the Old Country was just published last year. She currently lives in Spokane and teaches English Composition, Literature, and Creative Writing at Spokane Falls Community College, where she helps advise their creative arts magazine The Wire Harp. How long did it take you to write Dresses from the Old Country and how was that process? and I started sending outDresses in 2015, I think. I’d already been working on it though while waiting for the publication of Instructions, so I’d say maybe 4 years. The process was interesting because it was the first time I set out to write a book about one thing—what it’s like to live in the same place for almost an entire life, primarily focusing on the specific place, Spokane, Washington and the Pacific Northwest—but then it evolved into how place becomes a way to hold onto time and memory and to include other topics about the passing of time in my own life. I’ve seen this happen now with my third book as well: I just changed its working title to reflect how I see the collection changing. As a literary nonfiction student, I’m struck by how the topics of Dresses from the Old Country sound like things I’d encounter in memoir. How is writing poetry similar to and different from the work of a memoirist? I’ve noticed that many poets I know also write memoir or other types of nonfiction because they are similar. In fact, one of the panels I’m most interested in attending at next week’s AWP conference in Portland is called “Cheating on Poetry with Creative Nonfiction.” I guess I think what they have in common is that they take material from real life and give it artistic shape (though of course not all poets are writing autobiographically). But as someone who has tried to write creative nonfiction, less successfully than poetry, I think the difference, at least for me as a writer, is that poetry lets you hide a little more. You can string together a series of images and not explain everything, and in this way tell the truth but perhaps with a little more protection for the self. Also, when I’ve tried to write an essay, I get frustrated with having to explain so much, in part because I want my privacy and in part because I get bored because I already know what happened. And poetry can feel more magical to me: I like to move more quickly through a succession of images. Still, I really enjoy reading literary nonfiction and greatly admire people who do it well. If you could plan a perfect Saturday, what would it look like? Actually, I’m having one today! Our older son, Ben, is home from college for spring break, and our whole family just went out to our neighborhood coffee shop where our younger son, Matthew, amused us all, as usual. And this morning, I got to go to a poetry workshop given by three poets whose work I love, Keetje Kuipers, Geffrey Davis, and Erika Meitner. The workshop was about how difficult it is to write about family, and this is a subject I often write about, and a subject I struggle with writing about, so I really enjoyed talking with other writers about this struggle and also doing some writing together. Now I’m going to walk my dog, and tonight we’re going to dinner with friends, so it’s pretty much a perfect day. The 3 poets I just mentioned but also Dorianne Laux, Sharon Olds, and Ada Limon. And my community of poets who are also my friends, Maya Jewell Zeller, Kat Smith, Ellen Welcker, Alexandra Teague, Kate Nuernberger, Rachel Mehl, Brooke Matson, Aileen Keown-Vaux, and Tim Greenup. And I know there are others I’m forgetting! Also, I read a lot of fiction and nonfiction as well. I’m a big fan of Maggie Nelson’s nonfiction, and my favorite book of fiction that I read last year was Self-Portrait with Boy by Rachel Lyon. You were the poet laureate of Spokane from 2015-2017. Can you tell me about what that entailed or the opportunities that you had because of that position? I really enjoyed being the poet laureate. I did a project called I Am a Town for which I taught workshops at the library and at Spark Central, which is a local nonprofit that supports and creates arts opportunities for everyone. We wrote poems about Spokane and then we selected some for a public arts project in which we stenciled and painted lines from the poems on the sidewalks and streets by the places they’re about. This was such a fun project to be a part of. We have a strong arts community in Spokane, and this project and my position helped me build more connections within it. Do you have a favorite city in the world, and what makes it your favorite? Paris! I had the opportunity to study there for my junior year of college, and even though it was a hard year for me personally, I loved the city, maybe in part because I was young and homesick and it forged me. And I love the language and the art. What do you wish someone would’ve told you when you were in college? I wish someone would have told me the thing that my husband told me when we first met that made me fall in love with him: Life is long. People are always saying, Life is short, and sadly, for some people, it is, but I think sometimes living that way makes you rush too much and not calm down and let things unfold and realize there are so many things you can do and be. All in good time! It’s not every day that you get a chance to hear a National Book Award-winning author who’s from Ireland speak here on campus. But next week, you’ll get precisely that opportunity as author Colum McCann joins us here on The Bluff at 7 pm, Wednesday, February 20th, in Buckley Center Auditorium for a public lecture and book signing. There will also be a book discussion group facilitated by Fr. Charlie Gordon, CSC, on February 19th from 12 pm-1 pm in the conference room on the second floor of the library. 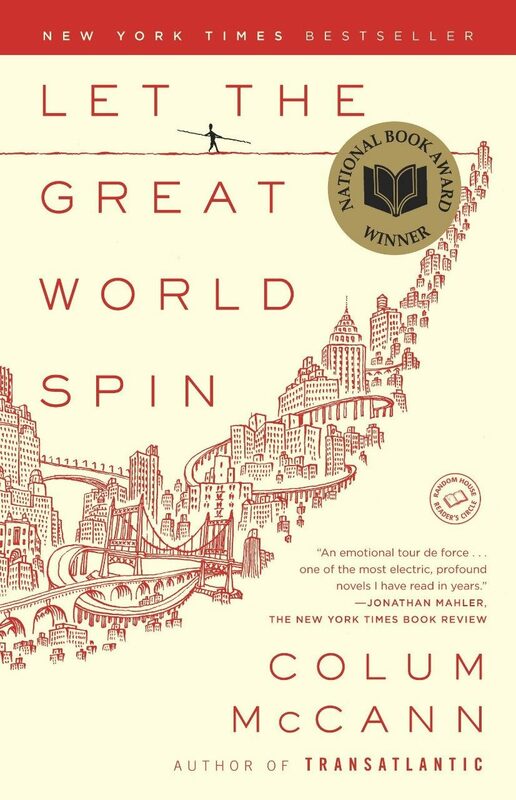 McCann’s book Let The Great World Spin won the 2009 National Book Award for Fiction and the 2011 International IMPAC Dublin Literary Award, one of the most lucrative literary prizes in the world. In addition, he’s written a total of six novels and three short story collections, had his work translated into 35 languages, and even received an Oscar nomination for 2005 short film based upon his short story “Everything in this Country Must.” Needless to say, McCann is extraordinarily talented and wildly successful—truly an inspiration for those aspiring authors among us. He currently lives in New York with his wife Allison and his three kids, serving as Distinguished Professor of Creative Writing in the MFA program at Hunter College. I was privileged to interview McCann prior to his upcoming visit, and if you haven’t already read Let The Great World Spin, I hope his absolutely lovely responses might motivate you to turn the first page in a breathtakingly beautiful read. For more insight into what Let The Great World Spin is about, check out Dr. Larson’s highlights of its compelling themes here. Can you describe your writing process a bit? How do ideas for stories come to you? I get obsessed by an idea and then I can’t let it go. The only way to let it go is to write it out of me. I am curious about the world, I suppose. And I like living “out loud.” Also I like books that throw me into dangerous, unfamiliar territory. I have to find a way out. It’s like one of those “Escape the Room” games, which my daughter Isabella sometimes takes me to. I want to escape the room of my obsession …. to find the key and open the door and, perhaps, if I’m lucky, enable some sunlight. Can you talk a little about the experience of being an Irish immigrant living in New York? Feel free to take this question in any direction you’d like. Being Irish in New York is easy. In general everyone likes the Irish. We don’t cause much of a problem. We like other people. We care about the underdogs. We listen well. We sing — often badly and loudly. We don’t mind embarrassing ourselves. Essentially, we’re hams. Describe your hometown and what it is that you miss the most about it (alternatively, if you don’t miss it, why not?). I am back in Dublin enough that I don’t get a chance to miss it. Perhaps I miss a slow pint in Toners pub every now and then, but in general I find my Dublin everywhere. Do you have a favorite film? What is it and why do you like it? Oh this is ridiculously self-serving, but it’s true. A friend of mine, Gary McKendry, made a short film of my short story “Everything in this Country Must.” It’s only twenty minutes long, but I love it. It got nominated for an Oscar 2005. Gary’s a genius. He caught the pure texture of the story. If you want to have a look at it, click here. Cats or dogs and why? Dogs, dogs, dogs. I have one sitting at my feet this very minute. I’m about to take her for a walk in the park. Ah, that’s the life. Food, sleep under desk, walk in the park, return, sleep, eat, walk in the park at night, sleep again, dream of food. It’s easier than writing. My teaching colleagues Peter Carey and Tea Obreht. Michael Ondaatje. John Berger. James Joyce. Toni Morrison. Oregon’s own Barry Lopez whose new book Horizons just took my breath away. And a million others … it would be impossible them all. Oh, and all my students. And all seven billion people I haven’t yet met! Mr. McCann, you’ve achieved tremendous success as a novelist and author of short stories. Besides the pleasure of your craft, what motivates you to keep writing? What do you hope your legacy will be when future generations encounter your work? Well, a late friend of mine, Jim Harrison, said in a poem: “Children pry up our rotting bodies with cries of earn, earn, earn.” Which is only partly tongue-in-cheek because I do have two kids in university and one in high school. But I suppose I am motivated by the desire to expand the lungs of my own world. I’m curious about the world and our place in it. I want to know what we can do to acknowledge the heartbreak of what unfolds around us. Also, how do we keep going? And how do we repair? And how can we better, not just for ourselves but for others too. It sounds lofty, but it’s simple enough — how do we make this patch of earth a better place? Books can do that. Featured Image from McCann’s website. Hi, friends! It’s the start of a fresh semester here on the Bluff, and do you know what that means? That’s right, there’s a new slew of accomplished writers lined up to come to campus and share their work and wisdom with us literature-lovers. First up is Elena Passarello who will be with us on Wednesday, January 30th at 7:30pm in the bookstore. As an essayist and actor, Passarello has garnered the attention of well-regarded literary minds all over the country; in 2015 she received the Whiting Award, an honor recognizing her as a talented emerging writer. Her most recent essay collection, Animals Strike Curious Poses, won the 2018 Oregon Book Award in Creative Nonfiction and made the best books of 2017 lists in The New York Times, Guardian, and Publisher’s Weekly. She’s also been published in The New York Times, Paris Review, and The Best American Science and Nature Writing 2018. She currently lives in Corvallis, OR, where she teaches creative writing at Oregon State University. I had the pleasure of interviewing Passarello, and I think you’ll find (like I did) her responses to my questions insightfully sharp and tantalizing. Tell us more about your award-winning work, Animals Strike Curious Poses. What’s it about? Tell me a bit about how it came to be. I like to make collections of essays that speak to one another as a cohesive book. Rather than fifteen discrete essays or essays that can only be loosely grouped by a common theme, I work to make the collection as a whole an essay in itself. So that’s the first thing I set out to do. Initially, I thought the essays would all cover famous animals–beasts that, at some point in history, were named and celebrated by humans, like Durer’s Rhino or Koko the sign language gorilla. I imagined a kind of interactive bestiary modeled after the books of beasts found in Medieval Europe. Those books discussed animals with this wonderful mix of fact and conjecture–a mix that I think a lot of nonfiction over the centuries has employed. As I worked through the collection, however, I realized that the essays didn’t depict the animals so much as the humans that named them and the cultures that surrounded their fame. So this book of animal essays is really a book about the human imagination. And the larger essay is the sort of portrait of human consciousness that it paints. When did you decide that you wanted to make a career out of writing and teaching? What inspired this decision? My undergraduate and graduate degrees are both in creative writing, but for about six years in between, I worked as an actor and voiceover artist. Working in theater is really fun, but you don’t have a ton of agency if you want to make a living. I left acting to go to grad school in search of a creative pursuit that’s more forgiving (sorry writers, actors have you beat in terms of tough rackets). I see a lot of overlap between designing a performance and hammering out an essay: both involve research, finding a voice, and tailoring a performance to communicate to a willing audience. And teaching for me checks a lot of other theater boxes. Plus, you get to eat a lot more carbs as a writer and teacher than you do as a working actress. As sort of a part B to question 2: Which authors inspire you as a writer? Who’s been formative in your life as a writer? And for fun, what’s a guilty pleasure read of yours? I love Anne Carson, Caryl Churchill, Sei Shonagon, Hilton Als, Eliot Weinberger. I read a lot of blogs about skincare when I should be writing or answering emails, which makes me feel guilty, but I do take pleasure in them. How do you see your acting roles informing your essayistic self or vice versa? I feel that energy is all you have in performance. I always saw acting as this wonderful opportunity to explore caged energy. Think about all the “controls” present in a traditional piece of theatre–by show time, the actor is told what to say, where to stand, how to move so that the lights hit her, and what to wear. This is not to say that there is no agency involved in scripted performance; only that, amidst such a tight bunch of controls, the only variable an actor has at her disposal is her energy, her spirit, the amount of live presence and fervor she can pour into that Apollonian cage. It is so fun to find moments of surprise while still working from within the iron bars of theatre’s parameters. Essaying is the opposite for me. There are no real controls, nobody telling you how to dress or what to say. The expression is nothing but variables, put up against the constant reality of the page. In building these tighter worlds from which I am expected to “perform” as a writer, I then try to find opportunities to surprise. As for favorite actors, I love Nicholas Cage. He is completely uninterested in “realism” as a part of his best performances, and I think contemporary essays should consider pursuing a similar goal. No performance is “real” and no essay is “true.” I’ve modeled more than one of my own pieces after Nic Cage performances. What advice would you give to aspiring authors or those interested in doing an MFA? Get to know the programs beyond their ranking or the accomplishments of their faculty. Figure out how you’d like to work with a mentor or a cohort, and then make your application decisions based on programs/faculty that offer specific things, rather than on the notable authors on staff. It really doesn’t matter if a mentor is fancy or famous; it matters if they are good teachers whose style of working can help you further develop your own process. Outside of reading and writing, what are your hobbies and interests? Every couple years or so, I get down on myself because other than writing, I have no hobbies or interests (this is exacerbated by the fact that I primarily write about things that interest me, so I’m always pursuing my interests when I work). Then I decide to take up a hobby, like the musical saw or container gardening, but it never lasts. So I basically hang with my cats, take long walks, watch TV and Beyonce videos, and write. Oh, and I eat a lot, too. Can eating count as a hobby/ interest? I find myself interested in eating pretty much daily. Have you faced challenges being a woman in fields (both writing and teaching at a university) that are predominantly populated by men? If so, how did you respond to those and what did those experiences teach you about yourself? One weird thing I’ve noticed is that people discuss nonfiction writing in gendered ways. More than once my writing–which is kind of shouty and bombastic–has been described as “masculine” or as running counter to this more feminine understanding of the lyric/experimental essay as quiet or unassuming. I can’t count how many reviews, editors, etc. have asked me to be “more personal” in my work, and sometimes I suspect that’s a gendered expectation of what women essayists do. It happens outside my own experience, too. When a woman writes a memoir, it’s “confessional” or “emotional”; when a man does, it’s “gripping” or “searing.” I think that’s bunk, but I’m frankly paying more attention to the gender binary as it shows up in my writing, reading, teaching right now. Looking at how we can run workshops or write about the world in ways that don’t evoke a strict either-or, model seems both important and very challenging. P.S. 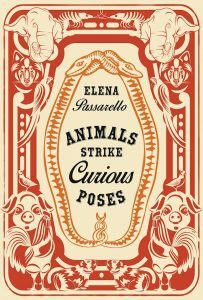 I’m sure she knows it, but the title of her newest essay collection, Animals Strike Curious Poses, is a line from Prince’s hit “When Doves Cry.” My personal recommendation is that you pick up Passarello’s book and enjoy it while grooving along to this classic 80s anthem. Trust me, it’ll be worth it. Happy Tuesday, my friends! If you’re a senior English major (like me) who’s eyeing graduation with more than a pinch of anxiety surrounding that dreaded ‘what’s next?’ question, this post is especially for you. For the third profile of the Humans of the English Department series, I caught up with Laura Misch, an alum who recently graduated with a BA in both English and Psychology this past May. 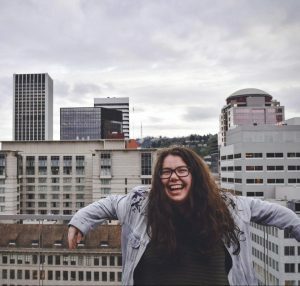 Laura is a UP English success story; stories like hers quell my fretful thoughts of graduating college only to take up residence in a van down by the river (side note: if you didn’t catch that reference, do me a favor. Stop reading this right now and go watch this famous SNL bit). Originally hailing from Henderson, Nevada, she’s now in Virginia at William & Mary Law School, pursuing her JD (juris doctorate, the degree that makes one an attorney). I found her reflections on her time spent as a UP English major to be particularly poignant. “Before college, I already had this amorphous idea of going to law school. (I think it was somewhat Atticus Finch inspired.) But, the idea didn’t go far beyond that initial thought. I was prepared to have this plan change in college, but it never did. Actually, I found that my English major helped shape my legal interests. Literature really exposes you to issues of social inequality—whether they pertain to gender, race, sexual orientation, SES, etc.—and many of them still persist today. And especially with first-person narratives, this exposure becomes very personal, as you live vicariously through these characters and indirectly experience the same social obstacles that they do. Thus, the English major further developed my sense of empathy, and this heightened empathy made me want to represent the underprivileged and those “outsiders” that we read about and love so dearly. I am not so naïve as to think that I can single-handedly change the world, but I hope to better someone’s life in even a minuscule way. More practically, the skills you use and foster as an English major transfer over to law school really nicely! I write, read analytically, think critically, and always look out for the finer details. -Music: the soundtrack from A Star is Born (my comment: go see the movie before listening! ); Sufjan Stevens’ Illinois album, particularly the song “Casimir Pulaski Day”; and “Scott Street” by Phoebe Bridges. Cheers to the week, lit lovers! Mark your calendars: this Wednesday evening, November 14th, at 7:30 pm in the UP bookstore, Portland poet and Adjunct Instructor Matthew Minicucci will treat us to a selection of his prize-winning poetry. Minicucci is the third and final visiting author of our Fall Reading and Lecture series here on the Bluff, and you won’t want to miss him! His most recent collection, Small Gods, was a finalist for the 2016 Green Rose Prize from New Issues Press. Minicucci has been the recipient of many awards and fellowships, testaments to the poignancy of his poetry. 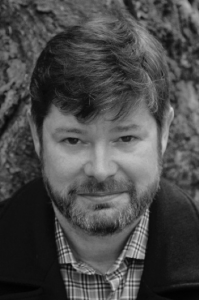 His work has appeared in the Alaska Quarterly Review, The Believer, the Gettysburg Review, Oregon Humanities, The Southern Review, and the Virginia Quarterly Review, among others. Can you tell us about how Small Gods, your most recent collection of poetry, came to be? Small Gods was a collection I was writing at the same time I was working on my first book, Translation. At one time, they were this massive tome of a book, but some sage advice from some wonderful teachers in grad school and right after grad school convinced me to make two manuscripts out of it, which was definitely the right call. The real focus of Small Gods is the intersection between faith and science. For me, a Catholic school kid growing up in Massachusetts, I found that intersection at loss. That when we suffer great loss, in our family, in our personal life, we seek out answers in some very specific places, and two of those places (for me) were faith and science. The hope of the collection is that it can take these concepts that might seem disparate on the surface and bring them closer together. Perhaps in an effort to bring all of us closer together. What do you like most about poetry and about being a poet? How do you think your role as a poet differs from writers of other genres? I think what I like most about being a poet is the embracing of a way of looking at the world outside of narrative. And perhaps this connects to the second part of your question. One of the biggest things a poet can do is show people that narrative is only one way of interacting with subjects and concepts in our daily life. I think it’s the most common way we interact with those things, because so much of our lives is narrative (I woke up, I drank coffee, I graded papers, I went to class, I had dinner, etc.) All of these things imply a linear order to things, when I think there are things outside of that order. Poetry allows us to embrace sound, meter, metaphor, etc. in an effort to understand the world. And I think those methods of interaction are just as effective and important as character and plot. Which authors and poets inspire you? A difficult question, as so many authors inspire me. I feel lucky to be able to reach back to authors from the ancient past, like Seneca, or Marcus Aurelius, or St. Paul. But I’m also lucky to have trained under amazing authors, like Brigit Pegeen Kelly, and Tyehimba Jess: poets whose work not only inspired me, but trained me how to be a poet. And I’m also lucky to be a part of a community of current authors changing the landscape of poetry right now. People like Jericho Brown, and Traci Brimhall, and Illya Kaminsky. There are so many more, of course, like Carl Phillips and Kevin Young and Jane Hirshfield, but I don’t want to ramble on forever. I think it’s often easy to think that poems just come to a poet in a moment of epiphanic revelation, as if the poem we read on the page just appeared in the poet’s mind in an instant. Could you talk about your own process of crafting poems? That’s a really great question. Thanks for asking. I think, like music or acting, a poem is designed to create that very response: the illusion of ease. If we could borrow a word from the Italian Renaissance, we would call this sprezzatura: that concept of something the audience knows is very difficult, but it’s accomplished with such apparent ease. In poetry, all the way back to a Petrarchan sonnet, the audience knows (somewhere deep down) it wasn’t that easy, but appreciates the ease with which the piece comes forward to them, as a reader. For my personal style, I consider myself a sort of “sculptor.” I generally write quite a lot, and I write it (generally) without form. So most of my craft process is a process of cutting away what isn’t the poem (which is its own complicated thought), and finding the proper form for what remains. These two things generally happen simultaneously. Or, at least, they do now, many years after I began writing poems. But it’s still an arduous process where a lot of things are left on the cutting room floor. If you could bring one person back from the dead, who would that be and why? Wow. That’s quite the question. I’m not really sure how to answer. There’s a lot of people I’d like to bring back to sit one afternoon and just talk their ear off. But, my real answer, the answer in my heart, is probably my grandfather, who passed away a few years ago. He was a kind and brilliant man who made furniture and homemade tomato sauces. It would be nice to help with either of those activities just once more. What advice would you give to aspiring poets? First, don’t stop writing. Paul Silva wrote a book called How to Write a Lot which had a quoted study about writers who write “when they feel inspired” and writers who (for the study) have been told not to write at all. The data suggests that those two groups basically write the same amount: nothing. The only way to get better as a writer is to keep writing, and the only way to keep writing is to, well, keep writing, no matter what. Second, be mindful of your literary community and the voices you can turn to for help or to help. Sometimes, it’s the voice of a friend that can unlock what a piece of writing is capable of, and sometimes you’re that voice. Helping friends, loved ones, students, etc. through their pieces can teach you more about your own writing than you ever thought possible. Last, if you want to move forward into publishing in magazines and/or books, recognize that rejection is a massive part of that. A lot of the best MFA programs take 1% of applicants, and the percentage of those writers who will go on to write books is also in the single digits. This is a hard thing. It’s hard to be a writer. You have to be ready for rejection, and you have to be able to rise above it. Does the piece need revision? Work on that. Does it not work? Would it be better to work on the next thing? Do that. Is the magazine the wrong place for it, and it’s a very good piece? That’s a possibility too, and you have to believe in yourself and the work. What will America look like in the year 2074? Will the future be bright or bleak? 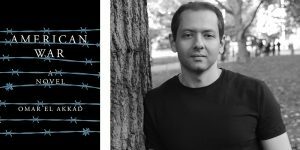 In Omar El Akkad’s debut novel, American War, 2074 is the year the Second American Civil War breaks out. Oil has been outlawed, rising sea levels have submerged the entire peninsula of Florida, and six year old Sarat Chesnut finds herself in the middle of this divided and ruinous world. Born in Cairo, Egypt, El Akkad has spent most of his writing career as a journalist. For ten years, he worked for the Canadian newspaper The Globe and Mail covering the War in Afghanistan, and in 2006 he won a National Newspaper Award for his investigative reporting. American War is his first novel and has achieved immense success as a bestseller, shortlisted for the 2017 Rogers Writers’ Trust Fiction Prize and for the 2018 Amazon.ca First Novel Award. El Akkad will be joining us on campus this Thursday, November 1st, for a Q&A from 4-5 pm in the Terrace Room and a lecture and reading from 7-8pm in BC Auditorium. You won’t want to miss hearing him! What prompted you to write American War, your debut novel? I was thinking a lot about the privilege of forgetting, the privilege of turning away from the suffering of millions of people on the other side of the planet. I decided to write a story that takes the hallmarks of the wars that have defined much of my lifetime – drone killings, refugee camps, “enhanced interrogation” – and recast them as something close to home, something from which it would be much more difficult for people in this part of the world to look away. And I couldn’t think of anything closer to home than a civil war, a war where you’re fighting yourself. What are your inspirations for your writing? I grew up reading mostly American authors (around the age of 12, I found copies of a half-dozen Stephen King books at my tiny high school library in the Middle East. It was those books that kickstarted my love of reading). American authors have been among my favorites ever since – chief among them Faulkner, Morrison, Baldwin and a slew of new writers such as Garth Greenwell. More recently, I’ve tried to read more authors from the part of the world in which I grew up. There are a number of Arab writers who, in my mind, are doing some of the most interesting work in literature – writers such as Basma Abdel Aziz, Khalid Khalifa and Ahmed Saadawi. All of these writers inspire me, but the predominant inspiration for my writing is a sense of urgency – I write about the things that I feel the most need to talk about, the things that make me angriest. Which authors and literary works have been key sources of inspiration for you? When I was writing American War, the book that inspired me the most is a work of non-fiction called Let Us Now Praise Famous Men. It’s a book by James Agee (whose novel A Death in the Family is perhaps my favorite work of fiction) that chronicles the lives of Southern sharecroppers during the depression era. Thematically and narratively it has almost nothing in common with American War, but it is the finest example I’ve ever read of detailing the intricacies of a quiet life. What excites you about your work as a writer? I derive a kind of joy from exploring questions to which I have no answers. Fiction is one of those creative spaces in which one can wander into the forest of a story with no map, no compass, no hint as to what might be the right direction. I enjoy that uncertainty, and the moments of serendipity that occasionally come with it – moments in which the writer moves outside themselves and finds something new, a different way of seeing the world. Besides reading and writing, I spend much of my free time rock-climbing. I’m also, for reasons I’ve never been able to adequately explain, a huge fan of TV shows about chefs and cooking (though I myself am a terrible, terrible cook). What advice would you give to aspiring writers and authors? Read, write and re-write. As much as you possibly can, do all three. The good writing lives beneath the bad writing, and so much of this craft is about peeling away the bad writing, draft after draft after draft. American War took 12 drafts to go from manuscript to finished form. The work of cleaning it up was tedious and sometimes joyless, but it was necessary. You were a staff reporter for The Globe and Mail for ten years. How do you see telling a story in the mode of a novel as opposed to journalism? Pros and cons? Journalism is, by definition, about answers – Who, what, where, when, how. Fiction is where I go to explore questions. In this way the two modes of writing are opposite sides of the same coin, and I don’t think I’ll ever abandon one for the other. I still practice journalism, though most of my efforts these days are focused on fiction. Why did you choose to tell American War from the perspective of a female protagonist? Of all the characters in the book, Sarat Chestnut is the only one who came to me fully formed. She arrived one day and, once she did, the story became hers. In much of my fiction, especially as I’ve grown older, the central character is a woman, and I suspect this has to do with the fact that virtually all my most complex and fulfilling emotional experiences have come from the women in my life. In the case of American War, which is in many ways a book about radicalization and extremism, I also wanted to explore those topics outside the male prism through which they are almost always portrayed. Whether I had any right to reach outside myself and write from the perspective of a different gender, and whether I managed to do it properly, are different questions. But in almost all my fiction I find myself most emotionally invested in the lives of my female characters. In preparation for his upcoming visit to campus, I sat down with author and PSU English Department Chair Paul Collins to discuss his newest book and his thoughts about writing. Collins’ work has been published in The New Yorker, Slate, and The New York Times, and his books that have been translated into a dozen languages. They include Not Even Wrong: A Father’s Journey Into the Lost History of Autism (Bloomsbury, 2004), and Blood & Ivy: The 1849 Murder That Scandalized Harvard (W.W. Norton, 2018). Come hear him speak and read at the UP Bookstore on Monday, Oct. 8th at 7:30 pm. You won’t want to miss it! Can you tell me about how your most recent book, Blood & Ivy: The 1849 Murder That Scandalized Harvard, came to be? That came about in part because the last few books I’ve done have been historical crime books. With this particular case, a few things pulled me to it. One, the obvious: how unlikely it seemed that a murder happened in a medical school full of cadavers. It seems like the setup for a mystery novel, except that it actually happened. It was also historically significant. It was a significant turning point in medical forensics. The other pull to this story was that this was happening during the American Renaissance, the period during the 1840s and 1850s in and around Boston, Harvard, and Concord where there was this amazing blossoming of American literature. All of those authors are kind of intersecting at least indirectly with the principal characters in this case. The case was appealing as an opportunity to evoke that particular era. Oh, wow. That’s a really good question. It was something that I always did. I started writing stories as a kid. But for me the moment where the light bulb came on was as a teenager. I might’ve been like 13 or 14, and I read Slaughterhouse Five. And I just was floored by it. I just sort of went ‘Wow, you can do that with narrative? !” And then my second reaction was, “I want to do that!” I think that was a lot of it for me. When I first started writing in elementary school, I just wanted to write funny stories. There were various humor essayists and columnists that I was reading as a kid who probably influenced me when I was really young. But in terms of having some adult notion of an art form and thinking “Wow, I want to do that,” that probably happened about the time of late junior high or the beginning of high school. For me, it’s the discovery process. I love working with the craft, writing a scene and nailing it. But that is a fairly ephemeral feeling, I think, for almost any artist. You know, you finish writing a scene, or composing a piece of music, or whatever, and you’re like “Yeah! I got that one.” Then, the next day you’re back to square one, facing a blank screen again. So it’s really more the process of doing the research that I really enjoy. I love finding new stuff and kind of bringing it back to life. And that’s true of writing articles, too. My favorite pieces are always the ones where it’s like a full-out resurrection of a book, author, or piece of history that just seems to have been forgotten. There are not many articles that really can rise to that standard. Usually you’ll find someone, somewhere who’s written something about it. But every once in a while, there’s a story where you just go “Wow, no one’s written a damn thing about this,” and I love that. I love finding stuff like that. What are some of your hobbies besides reading and writing? I love traveling, and I love music. I play the piano and I play the drums. Drums are really my main instrument. I try not to annoy the neighbors too much. Out of all your works, which is your favorite? It’s funny because some I feel are good on technical grounds, that the finish on them is really good. But the one that’s closest to my heart is Not Even Wrong, the one about my son. I’ll probably revisit that one someday. It came out in 2004, so I was basically writing it in 2002-2003. It’s a memoir about the first year after my son was diagnosed with autism, intertwined with a history of autism. Obviously, a lot has happened since then, for one. He’s taller than I am now. And also, just a lot in terms of the medical understanding of autism and a lot of information about the history of autism has come out of the last couple decades. So, it’s something I’ll revisit someday. I suspect that when I do, that will become my favorite book. It’s personally meaningful. What advice would you give to writers? A few things I guess. The first is the most hackneyed piece of advice of all, but it’s true: read. Read omnivorously and read a lot. There are two other things. One is that if someone is interested in writing books, you have to care about the subject, so don’t write about something because you think someone else will like it. You have to write about it because you like it. If you don’t, you won’t finish it; or if you do, it’ll be a miserable experience. So, you really just have to find the thing that you like or that fascinates you and go on the assumption that at some point someone else out there is going to be fascinated by it, too. It’s almost the only way to sustain a book-length effort. One other thing I would encourage people to do is to try out different forms of writing. When I started out I was absolutely certain I was going to be writing fiction, that I was going to be writing novels. All the classes I took were in fiction. As it turns out, my almost accidental exposure to writing journalism was crucial. Later on, I decided to try to write a screenplay, and they wound up at the bottom of my desk right away. But, it was an incredibly useful experience because in screenwriting you have to think in scenes, and you have to learn how to write dialogue. It was one of the best things I ever did for my writing. It’s the same for anything like that. A journalist who takes a poetry class, or vice versa, they’re gaining a new set of tools, working a different set of muscles, and it’s going to be useful.